Epiphany – The EB-5 Program Hurts American Millionaires! 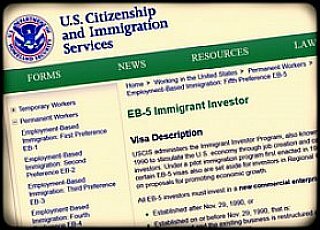 It hit me the other day: The immigrant investor (EB-5) program hurts American millionaires, but they have not noticed, sad to say. For decades I have been writing about how temporary foreign workers swell the labor force unnecessarily, reducing wages for resident workers through the operations of supply and demand. If there is an ample supply of workers, lower wages result. It's called a loose labor market, and employers love it. I had never applied that same formula to the supply of capital. If a group of foreign investors is willing to take much lower returns on their capital, as foreign workers take lower wages, then would not that lower the return on capital for citizen investors? Of course! Then there is the question of concentration. Let's use the Bureau of Labor Statistics figure for January, showing a little over 161 million people working or seeking work. Suppose there were four million temporary legal foreign workers in the country at any one time, and they were scattered evenly across the economy, from Wall Street to the wheat fields, from Miami to San Diego to Seattle to Bangor, Maine. If there was a single foreign worker in all groupings of 40 workers, the impact would be hard to discern, but suppose they are concentrated in IT, in hand-harvest agriculture, and in landscaping (as they are). Would not their presence and their concentration have a much bigger negative impact on wages than if they were spread around equally? Of course. Interestingly, there is a similar concentration in the EB-5 business. It calls for the provision of green cards to families offering $500,000 in DHS-approved, but not guaranteed, investments. As we have noted in the past, this program — designed originally to encourage the economies in depressed areas — has been converted to one in which most of the money is used in big city real estate deals, with an extra-large concentration in New York generally, and specifically in Manhattan. These investments are not only centered geographically, they are focused on one specific type of urban investment: mezzanine financing in construction deals. As a result, we are told, projects with EB-5 financing are paying 1 or 2 percent a year for this kind of financing, which goes for 10 to 12 percent where EB-5 is not present. This is both a bonanza for the EB-5 middlemen (largely citizens) and must be blow, if a hidden one, to another group of citizen millionaires, ones wanting to lend out their money at plausible rates. Usually millionaires, and particularly multi-millionaires, can take care of themselves politically, and the rest of us need not worry about them. But that misses the point — there are the organized rich (in this case those profiting from EB-5 loans) and the non-organized rich, the ones who might be collecting nice returns on their mezzanine real estate investments, but who are not doing so. And, as is virtually always the case, the organized rich out-politic everyone else in sight, even their non-organized peers. And the EB-5 program marches on.